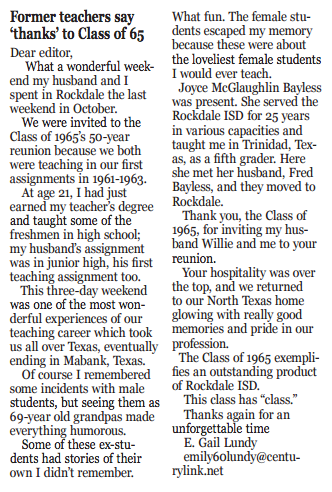 Please send information about upcoming Class Reunions to Rebecca King (rking@rockdaleisd.net). The Class of 1969 will celebrate their 50th Reunion on the weekend of Homecoming. RHS Class of 1966 50th-plus Annual Class Reunion Saturday, Oct. 6, 2018 2 p.m. - 10 p.m. Kay Theater, 152 North Main St., Rockdale The party will start at 2 p.m. with meet & greet, moving on to food, fun and games, then evening drinks and dancing. Setups will be provided. BYOB. $35 per person. Send payments to Nicki Hirt, PO Box 372, HIghlands Tx 77562 by Sept. 15th please! Rainbow Courts is holding a block of rooms for our class. Please make your reservations ASAP by calling R.C. at 512-446-2361. Hope to see you all there! We may be old.... but we're still fun! For more information see the Rockdale High School Class of 1988 Facebook page. It will begin at 3:00 PM with a social house and the kitchen will open for the reunion from 4-5PM. Each person will be responsible for their own tickets.The class will ask for donations to cover the event center cost. Members of the RHS Class of 1951 will hold their 66th reunion on Saturday, June 10 at the home of Pat and Charlie Watson in Rockdale. Classmates and friends will gather at the Watson home at 10 a.m. and lunch will be served at noon. The RHS Class of 1957 will hold its 60th year reunion at noon Saturday, June 10 at The Ranch, 415 West US 79 in Rockdale. The RHS Class of 1972 will hold its 45th year reunion on Saturday, October 14, 2017 at 5:00 PM at Apache Pass. Private room has been reserved. Fun and live music provided, no cover charge and all food and drink must be purchased from Apache Pass limited menu. Visit RHS Class of 1972 Facebook page. Members of the Rockdale High School Class of 1996 will hold its 20th class reunion the weekend of Sept.23 & 24. Saturday Sept.24 at 5:00pm- Gathering at Apache Pass Icehouse, (9112 N FM 908, Downtown Tx) . Fun and Live Music provided, no cover charge and all food and drink must be purchased from Apache Pass Icehouse. Contact Michael Young for more information. 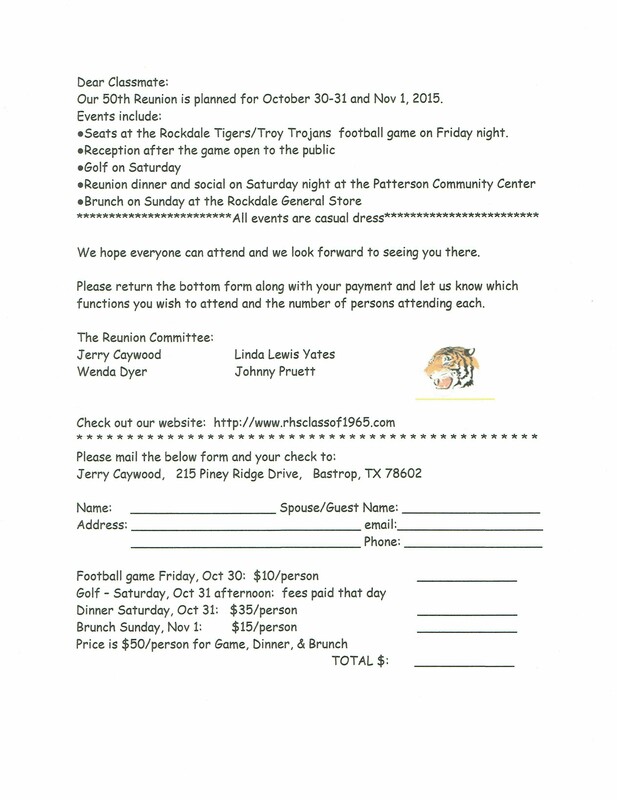 SATURDAY, THE RANCH - Rockdale High School Class of 1966 will hold its 50th year reunion the weekend of October 28, 2016 at The Ranch in Rockdale from 2:00-4:00 PM. Anyone wanting to stay after 4 or return Saturday evening are welcome to do so. FRIDAY, FOOTBALL GAME - Those who want to attend the football game Friday night together can contact Jimmy Keen at 512-760-7443. SUNDAY, BREAKFAST - We will have breakfast at Nancy Baggett Coleman's house Sunday at 10:00 AM. PLAN/DECORATE - Anyone who wants to help decorate or plan activities please call Nancy. Please pass this on if you have contact info for any of our classmates. Classmates are asked to send email addresses to Roy Lee Muston at texrm@earthlink.net or William Stork at Bill.Stork@sbcglobal.net. QUESTIONS - Classmates can also call Nancy Baggett Coleman at 512-657-9571 or Eddie Bell at 512-455-9571. Rockdale High School Class of 1986 will hold its 30th year reunion on Saturday, August 6th at 8:00 PM at The Ranch, 415 W US Hwy 79, Rockdale. There will be a $10 cover charge per person for that night's entertainment, Vegas Stars. Visit RHS Class of 1986 Facebook page or contact Tammy Praesel Alford at 979-406-0006 for more information about activities before the show. Rockdale High School Class of 2001 will hold its 15th year reunion on Saturday, July 16 at 5:00 PM at Apache Pass. More information to be announced. Visit RHS Class of 2001 Facebook page or contact Mindee Popham, 512-799-0594. Members of the Rockdale High School Class of 1991 will hold their 25th class reunion the evening of Saturday, June 11 at Apache Pass. We hope everyone can attend and we look forward to seeing you there. RHS Class of 2005 The RHS Class of 2005 will hold its 10th-year class reunion on Friday, Oct. 30. Plans are to socialize at Apache Pass, 9112 N. FM 908 in “Downtown, Texas” at 8 p.m. FMI: email carynbland@gmail.com. Golf: Arrive by 8:30 AM, Tee off at 9:00 AM. $35.23 for 18-holes with a cart. Contact Chris Mercer for more details. Text/call 254-482-0045 or Message him on Facebook. Family friendly. Rock to the music of our time. Check out The Mullet Boyz. Doors open at 5:00 PM. Kitchen open. Band starts at 9:30PM. Get there early or call The Ranch to reserve a table, 512-446-7005. Not advised for kids. $10/person at the door. Get in a final visit with classmates and enjoy a yummy breakfast. We'll be serving from 9:00AM-11:00AM. Dell's address is 1800 Yokley. Family friendly. Donations to cover costs and help fill the class coffers. Contact Dell Perry Giles with questions and suggestions: Text/call 678-613-2955 or email dellperry@gmail.com.